Danica Patrick won her first NASCAR pole on Friday when she laid down the fastest lap in qualifying for Saturday night’s Drive4COPD 300 Nationwide Series race at Daytona International Speedway. Patrick posted a speed of 182.741 mph in the qualifying session. That beat defending Daytona 500 winner Trevor Bayne by one-thousandths of a second. Shawna Robinson was the only other female driver to win a pole in one of NASCAR’s top three series. Robinson started on the NNS pole at Atlanta in March of 1994. 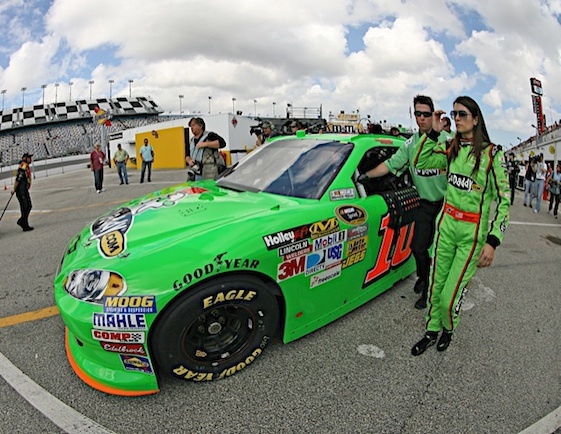 Her car owner, Dale Earnhardt Jr., said, “I’m really happy about Danica’s run. Here winning the pole is a neat deal, and she deserves it. She works hard, and Tony (Eury) Jr. and those guys work hard, and I’m just happy that JR Motorsports will be up there for the start of this race. Elliott Sadler, Earnhardt Jr. and 2011 NASCAR Camping World Truck Series champion Austin Dillon completed the top five. “In the last 24 months, I think she’s the most improved driver we’ve had, in all three series,” Sadler said. Sam Hornish Jr., Tony Stewart, Cole Whitt, Brad Keselowski and Ricky Stenhouse Jr., the defending Nationwide champion, round out the top 10 qualifiers. Stewart has won the last four Nationwide season-openers at Daytona. Morgan Shepherd, Derrike Cope, Erik Darnell, Scott Speed, Mike Harmon, Chase Miller and Donnie Neuenberger failed to qualify. Patrick’s pole comes just a day after she was involved in a scary wreck in the Gatorade Duels at DIS. She was uninjured in that wreck but her car was demolished.